With an estimated 500,000 'Internet of Things' devices using default security credentials it's little wonder that the recent Mirai botnet's DDoS attack was able to cause such widespread disruption. But it isn't just the average home-user that's at risk. Organizations like yours are being targeted with bespoke malware in order to compromise your network and add your servers and devices to malicious botnets. 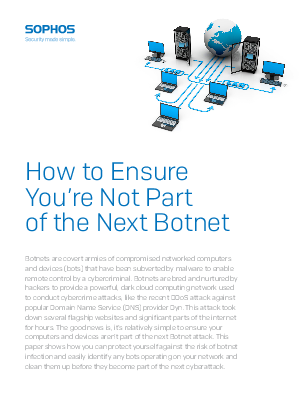 This paper explains why these attacks are so successful, how a typical infection takes place and what security systems your organization should have in place to defend against botnet proliferation.